The calibration part of the print bed has been redesigned and improved in a way that the print bed only needs to be calibrated once now. The clever designed part always keeps the print bed leveled after the first calibration. The upgrade contains a new Extruder Insert part, made from a stronger material which results in improved durability. The redesigned frame parts allow for easier calibration of the print bed. All improvements in the upgrade kit together result in a higher level of durability and increased stiffness of the extruder frame, resulting in higher accuracy when printing. The redesigned extruder frame increases the stiffness of the extruder, resulting in even higher quality prints. The stiffness is required to prevent the extruder to vibrate when moving. Vibration may cause unwanted errors in the printed object. The new extruder frame part allows for easy calibration of the individual hot-ends. With an Allen key (Hex key) (size 2.5) the right hot-end can be perfectly positioned to exactly line up with the left hot-end. The new frame part also allows the right hot-end to be stowed away to prevent the right hot-end from colliding with printed parts when printing in single head mode. To fully benefit from the upgrade, we recommend to use the newly developed FELIXbuilder. 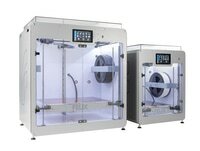 FELIXbuilder is the official software customized for FELIXprinters to process, adjust and slice digital, printable objects to print with the best possible outcomes on a FELIX 3D printer. FELIXbuilder has an intuitive workflow but without loosing any manual control features. 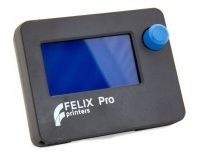 A complete application, optimized for working with FELIXprinters to create even more impressive results. FELIXbuilder is available for both Mac and Windows.